With candor, humor, and warmth, legendary musician, actress, activist, and icon Olivia Newton-John reveals her life story—from her unforgettable rise to fame in the classic musical Grease to her passionate advocacy for health and wellness in light of her battles with cancer. Perfect for fans of Tina Turner’s My Love Story and Sally Field’s In Pieces, this international bestseller is an extraordinary can’t-miss memoir. For more than five decades, Olivia Newton-John has been one of our most successful and adored entertainers. A four-time Grammy Award winner, she is one of the world’s bestselling recording artists of all time, with more than 100 million albums sold. Her starring roles in the iconic movies Grease and Xanadu catapulted her into super-stardom. Her appeal as a performer is timeless. In addition to her music and screen successes, Olivia is perhaps best known for her strength, courage, and grace. After her own personal journeys with cancer, she has thrived and become an inspiration for millions around the world. A tireless advocate for countless charities, her true passion is as the founding champion of the Olivia Newton-John Cancer Wellness & Research Centre in her hometown of Melbourne, Australia. Olivia has always radiated joy, hope, and compassion—determined to be a force for good in the world. Now she is sharing her journey, from Melbourne schoolgirl to international superstar, in this deeply personal book. Warm, candid, and moving, Don’t Stop Believin' is Olivia Newton-John's story in her own words for the very first time. Olivia Newton-John, AO, OBE, is an English-born, Australian-raised singer and actress and philanthropist who was recently the recipient of an Honorary Doctorate of Letters from La Trobe University. 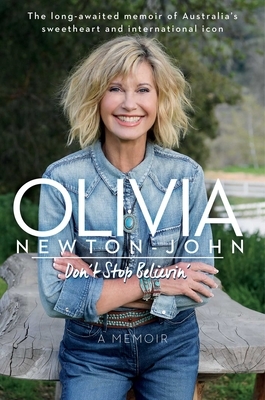 With a career spanning more than five decades and more than 100 million albums sold, Olivia's successes include four Grammys; numerous Country Music, American Music, Billboard, and People's Choice Awards; an Emmy Award; ten #1 hits; and more than fifteen top-10 singles. She also scored another #1 hit, this time on the Billboard Dance Club Songs chart, with “You Have to Believe,” a duet with her daughter, Chloe Lattanzi—becoming the first mother/daughter duo to top this Billboard Chart. In 1978, her co-starring role with John Travolta in Grease catapulted Olivia into super-stardom and to date it remains the most successful movie musical of all time. In 2018 the film celebrated its fortieth anniversary. Olivia has been a longtime activist for environmental and animal rights issues. Her personal journeys with cancer led her to announce her partnership with Austin Health and the creation of the Olivia Newton-John Cancer Wellness & Research Centre (ONJCWRC) on the Austin Campus in her hometown of Melbourne, Australia. She also co-owns the award-winning Gaia Retreat & Spa near Byron Bay.